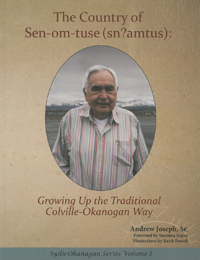 Learning the importance of self-sufficiency and hard work from his parents and cultural teachers early in, life Andy Joseph Sr. carved out a career as a skilled laborer, accomplished athlete and elected leader of the Colville Business Council. When Andy started school, knowing nearly nothing of English, he quickly became proficient in the exclusive language of his teachers. Andy's stories demonstrate how he managed to adapt to such challenges and still retain his traditions. As an adult, he has shared his language and culture with many younger tribal members who now struggle to acquire a basic vocabulary. Telling and listening to life stories is an important social activity among tradition-oriented people worldwide. This book features a collection of stories as remembered and told by Andy Joseph, beautiful illustrations by Keith Powell and a foreword by Susanna Hayes.